John Riley reviews the new Samyang AF 50mm f/1.4 for Sony FE cameras, the AF 50mm f/1.4 is Samyang's first auto-focus lens. Samyang has long been recognised as a manufacturer of high quality, inexpensive and interesting lenses. The one thing missing has been autofocus, as all their lenses up until now have been manual focus only. 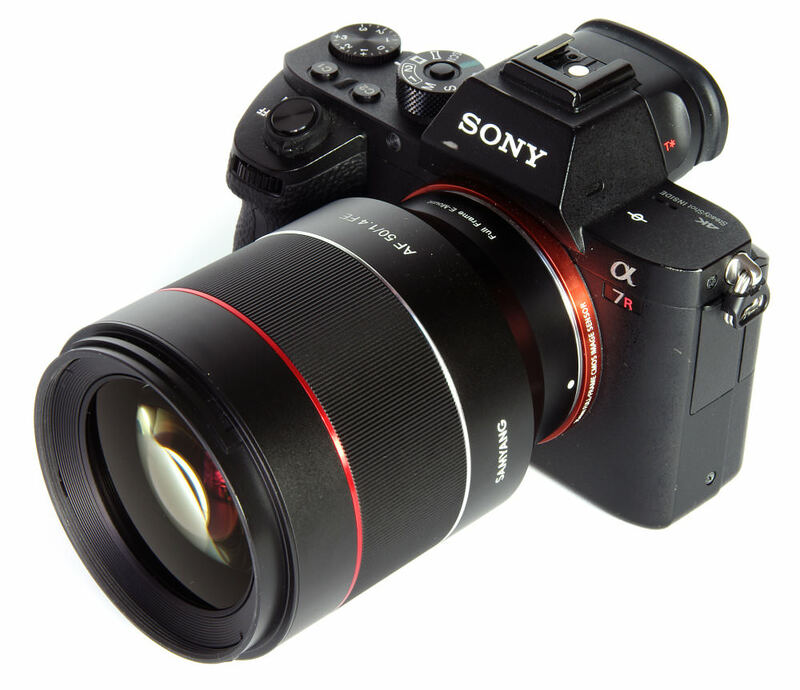 Everything has changed with the introduction of the Samyang AF 50mm f/1.4 lens, now featuring AF and reviewed here using the Sony Alpha A7R II. Let's see how its performance stacks up and how this first foray into AF has turned out. The lens has been specially designed for mirrorless cameras. The back focus distance is reduced to take into account the requirements of the mirrorless camera. Thus, the lens can have its rear element very close to the sensor, without having to resort to a retrofocus design to make room for the mirror box assembly on a DSLR. However, as Leica has already found, this is not quite the same advantage as a rangefinder camera with film. Especially with wider angle lenses, their rear element naturally lies very close to the sensor plane, resulting in oblique light rays from the edges. Digital sensors like telecentric designs, with light rays exiting the lens as parallel as possible, and this is not always so easy. This all results in a relatively large lens for its specification, weighing a formidable 585g compared to a conventional DSLR 50mm f/1.4 lens that might weigh as little as 220g. Having said that, it is manufactured substantially using metal and looks very good mounted on the Sony Alpha A7R II. It mounts solidly, with no play whatsoever in the mount / lens interface. As we take a tour of the lens, there is very little on the outside to see. The 67mm filter thread is surrounded by a well machined bayonet for the slick and generously sized bayonet lens hood. The nine-bladed diaphragm can be clearly seen, forming a reasonably circular stop. The only other feature is the finely ribbed manual focusing ring. It is fairly wide and placed exactly where we might want to hold the lens in use. This is very convenient, but accidental shifting of the focus point should be watched for. The feel of the ring is light but not excessively so. The one major omission is weather resistance. This is something that is becoming increasingly standard and, whereas it would not have raised a mention at one time, things have moved on. On the inside, we have 9 elements in 8 groups, three of which are aspherical. The lens is internal focusing, so it does not rotate or extend in use. This is helpful when using polarisers and graduated filters. Minimum focusing distance is 0.45m (1.47 feet), a maximum magnification of 0.15x. This is fairly typical of any traditional 50mm lens. Of course, the addition of AF for the first time is of especial interest. It is quiet in operation and locks on swiftly and reliably. Some DSLRs are faster, but this is a property of the camera as well as the lens. For the sort of subjects a 50mm lens is expected to handle, it is more than satisfactory and were it not a new feature for Samyang it would probably pass without note. A successful introduction. Sharpness can simply be described as excellent. In more detail, centrally every aperture reaches this standard, the lens peaking at between f/2 and f/11 where the figures are very even throughout. The actual pinnacle of sharpness centrally is f/2.8 but in reality it is little different from the other mid apertures. It's pretty impressive. 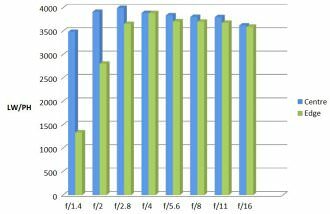 The edges show lower figures, but it's only really at open aperture that performance falls to fair, the results being quite soft. 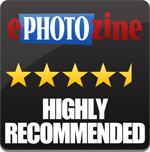 This improves by f/2 which is very good and after that we are back to an excellent standard throughout. 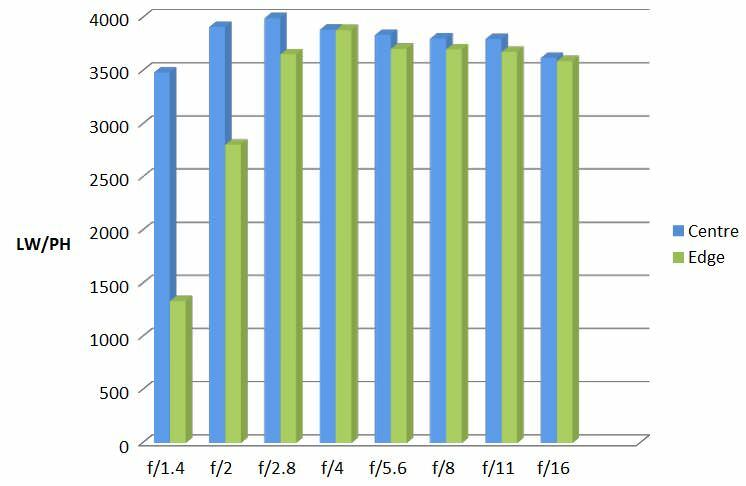 Actual peak performance is at f/4, but again the margin between this and the other excellent apertures is very small. The blue column represents readings from the centre of the picture frame at the various apertures and the green is from the edges. The scale on the left side is an indication of actual image resolution as LW/PH and is described in detail above. The taller the column, the better the lens performance. For this review, the lens was tested on a Sony Alpha A7R II using Imatest. CA (chromatic aberration) is very well controlled in the centre of the frame, almost eliminated. The edges show around one pixel width of fringing, but this does not show in the images until we have more demanding lighting. The usual suspects in this are branches against bright sky and the rim of rooftops. In any event any residual CA can be addressed in software. There is -0.948% barrel distortion, which is typical for a fast 50mm lens. This too can be corrected in software if desired, but in general photography is not too obvious. Overall, the lens produces very pleasant, sharp images, with a smooth bokeh that shows well throughout the aperture range. Flare can be induced when the sun is virtually in the frame, but rather than creating reflections it tends to manifest as a loss of contrast. 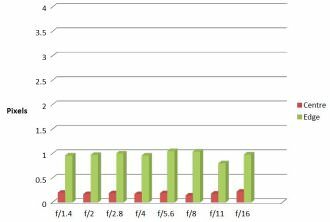 In normal use, flare is not a problem. 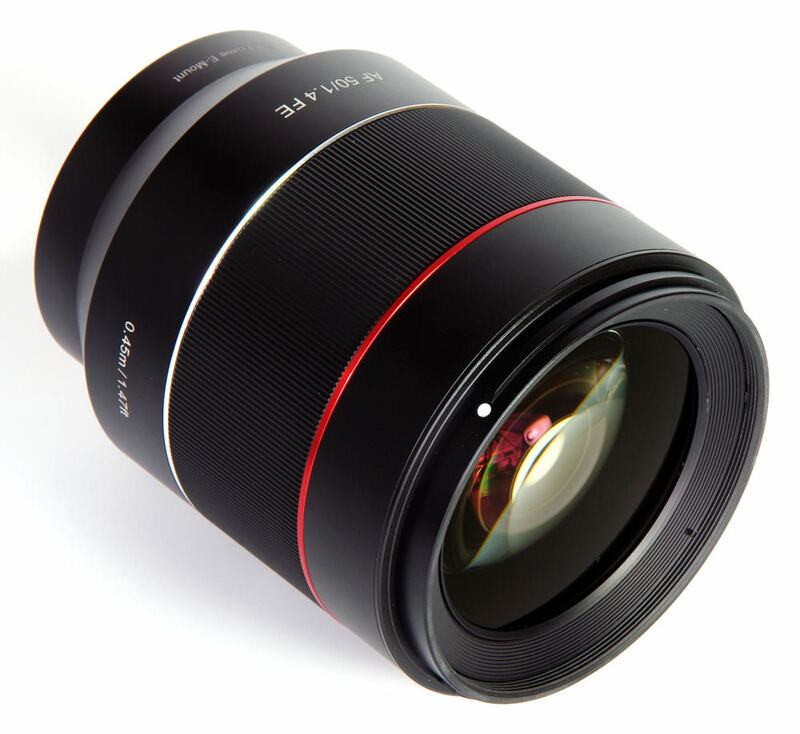 In summary, the lens performs to a very high standard and as the first AF optic in the Samyang range, holds its head high and delivers the quality. The Samyang AF 50mm f/1.4 FE lens is priced at £449. There is a dazzling array of 50mm lenses for the Sony FE full frame mount, but most of them are not f/1.4 designs. There are the Zeiss FE 50mm f/1.4 ZA Planar T* (£1499), the Samyang 50mm T1.5 XEEN Cine Lens (£1599) and the Samyang 50mm T1.5 AS UMC Video lens (£399). Other 50mm options are the Zeiss FE 55mm f/1.8 ZA Sonnar T* (£618), the Sony FE 50mm f/1.8 (£239) and the Zeiss 50mm f/2 Loxia (£719). There are a wide variety of designs available at various price points, but the Samyang does look very good value, especially considering its excellent standard of performance. 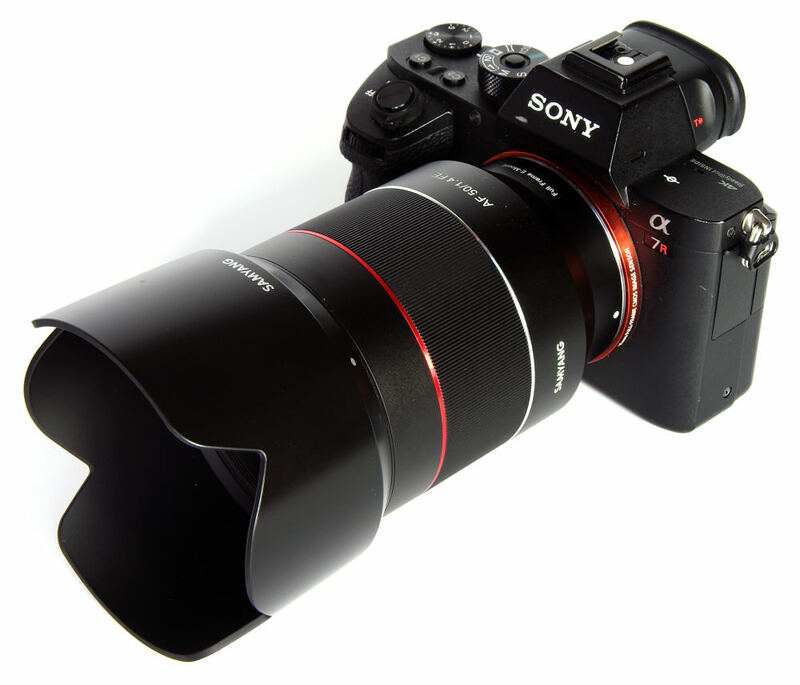 For more options have a look at the Top 10 Best Samyang Lenses. Samyang's lenses have always looked interesting. Now, with the arrival of AF, they move into new territory and this first offering is a beautiful lens that performs to a very high standard. The cost has been a fairly large and relatively heavy lens, but that may be a small price to pay for an optic that can deliver such beautiful results. 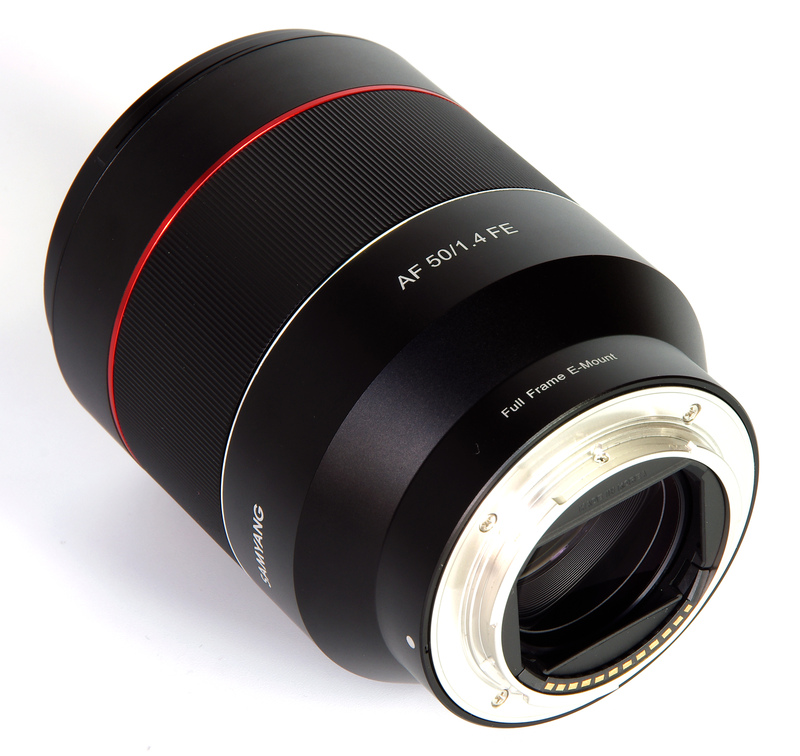 The Samyang AF 50mm f/1.4 is a high quality lens, with excellent sharpness, and available at a competitive price. If I hadn't already bought the Zeiss FE 55mm f/1.8 ZA Sonnar T* I would be very interested in this. I have the fully manual [link=http://amzn.to/29PkR6N]Samyang 85mm 1.4[/link] and it's an outstanding piece of glass. It's fantastic news to see that Samyang aren't resting on their laurels and are creating products that fully challenge native glass. If I hadn't already bought the Zeiss FE 55mm f/1.8 ZA Sonnar T* I would be very interested in this. I have the fully manual Samyang 85mm 1.4 and it's an outstanding piece of glass. It's fantastic news to see that Samyang aren't resting on their laurels and are creating products that fully challenge native glass. Im interested in testing the lens but I'm not overly impressed with the barge image above. I'd have expected a nice tack sharp image at f11. So lets get some images on board with this lens and see if Samyang actually hit a home run with this lens. I too have two manual Samyang lenses. The 85mm and 35mm. I like them both but that 35 is just too large for my taste. I really like the 85mm. Im looking for a good all around 50mm autofocus. Might just go with Sony Zeiss glass. Its a hit out of the ball park and a good price too. Don't forget the narrow boat is on water and might well be moving slightly. When we download the High Res version and put it through Photoshop, it gives a proper idea of how sharp it is. 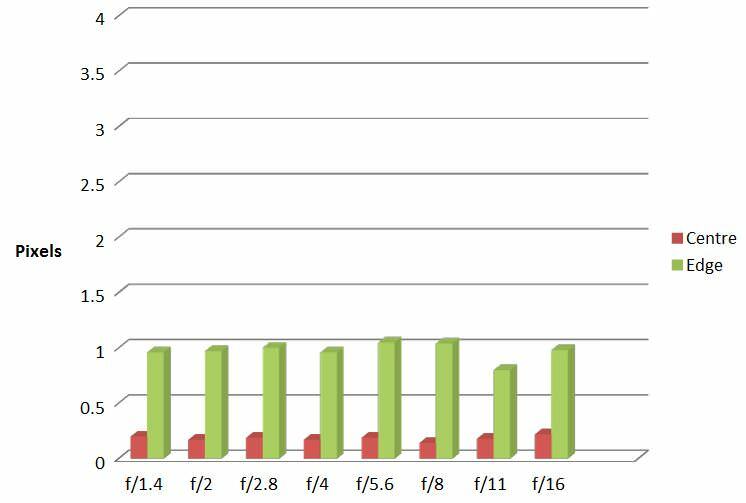 It also shows up the amount of CA we might expect, although that can be corrected in software. The house behind is not moving. At f-11 the barge and house should be sharp. Send me a lens and Ill be happy to run it through its paces and give an honest review then send the lens back. Ive been wanting to do a review of this lens now since it was first announced you were doing an Auto Focus. Good, about time samyang had some AF lenses, now make a fuji x mount AF 50mm with 1.4 and ill be beside myself! So is this then a better performer than the FE 5mm? Most people want see sample photo at f1.4. There are only two here. One at night with 1/15 shutter make the image blur. The other shot of flower looks pretty sharp at f1.4. Hope to see more shots at f1.4. The other pics are not bad. Good focus on the eye. True but I agree with the other poster. With this lens we mostly care about 1.4 images because Sony already has an amazing 55mm F1.8 so the performance at 1.4 is what makes or breaks this lens for many.